The 10', black Mini DisplayPort Male to DisplayPort Male Adapter Cable from StarTech features a Mini DisplayPort male connector on one end and a DisplayPort male connector on the other. It enables you to connect your Mini DisplayPort-equipped laptop or Mac family product to an HDTV, monitor, or a projector that uses a standard DisplayPort connection. Box Dimensions (LxWxH) 6.6 x 6.3 x 0.8"
Mini DisplayPort Male to DisplayPort Male Adapter Cable (10', Black) is rated 4.9 out of 5 by 9. Rated 5 out of 5 by WillP from Perfect! 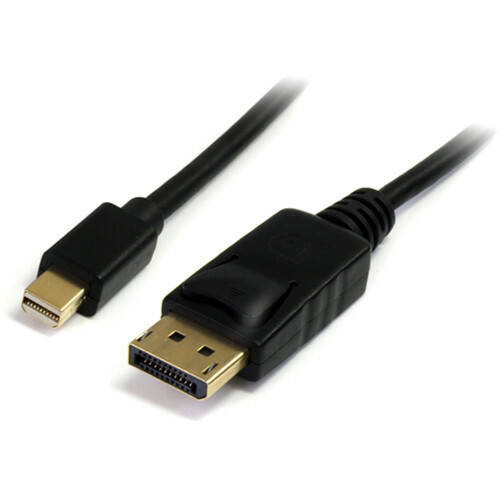 This Star Tech cable works perfectly and provides true HD through the DisplayPort input on your monitor. Easy to set up. Low cost and no issues... I love it. Rated 5 out of 5 by Joseph S. from IT WORKS AS ADVERTISED ! This product is reliable and works as advertised! Rated 5 out of 5 by Mark from Great product, great price. Very dependable and I thought the price as very good. It's fast and doesn't add any noise or distortion to the picture. Rated 5 out of 5 by Douglas from Good price--does the job Needed this for connecting my Mac Pro to the LG 38uc99-W 38 curved monitor. Does the job. No complaints. Rated 4 out of 5 by TM the LD from Works fine, no problems Was skeptical that a video cable this cheap would be OK, but it's been fine. No problems at all. Rated 5 out of 5 by Tomas from Buy this if you need one. Worked perfectly. Good quality. Nice simple ziplock bag packaging with covers on plugs. Rated 5 out of 5 by James from Works Great Purchased to feed a 4k monitor from a Mac Pro. So far it works great. What version is this cable? 1.1; 1.2; etc? Hi Kevin, we did not buy the cable because of the version, in fact we did not know they had versions for this type of connections, it is not like a USB connector. What I can tell you that only the name brand cables worked with the asus zen book computer connecting to the asus PB278Q WQHD display to give the highest resolution. We tried several made in china no name cables' and they did not work. Thought something was wrong with display or computer and took it into 2 different shops to get the problem solved, which was intermittent, but mostly not working. Finally got 2 different name brand cables and both worked.Hope this helps. Is a display port the same as a HDMI Port? No they are not. Do an internet search for Displayport vs hdmi and you will find articles that will explain better than I can.